Vueling discount code: save 50% off space seats! Swiss Air Lines sale: Non-stop Zurich to the Seychelles or Mauritius €505! Planning to use service of Spanish low-cost carrier Vueling and want to threat yourself to luxury consider current Vueling promotion offering 50% discount off their space seats. (Granting up to 20% more leg room). This offer is valid only for few next days but you can. To enjoy the promotion, all you have to do is enter Vueling discount code when you book a flight on their website or mobile portal. This offer works on all routes and all flights (if not sold out). You can apply this Vueling promotion code in second step where you choose your flight. Then simply proceed to third step “Customize your flight” and select one of “Space Seats” options. This current Vueling discount code is valid for flights in travel period from November 2018 to June 2019. However you need to make your purchase by 26th of October 2018. This promotion cannot be used in conjunction with other promotions. 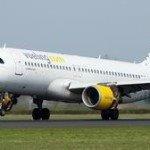 Booking sample of Vueling discount code: save 50% off space seats! This voucher is available only for next few days and grants great discount off seats in front rows which grants better seat comfort as well as more space.